The interior of the restaurant is very dark although brightly lit from the huge floor to ceiling windows that overlook the Corniche. 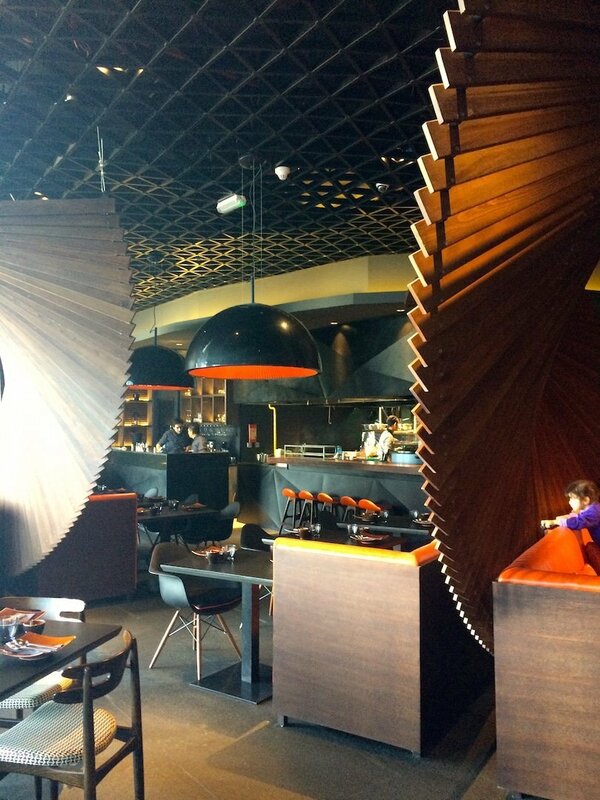 The interior is well designed and is quite unusual – I liked the fan designs that act as partitions throughout the restaurant, they made for an arty touch and of course provide extra privacy to divide tables and areas. It was a Friday lunchtime when we visited so it was pretty quiet, with only a few people dining and a couple of families with young children. I can imagine it would be far busier in the evenings – in my mind the decor and style of the place lends itself to that fact. As it was lunchtime, we just wanted a bit of a snack really so we decided to stick with just a few appetisers to share between the two of us. 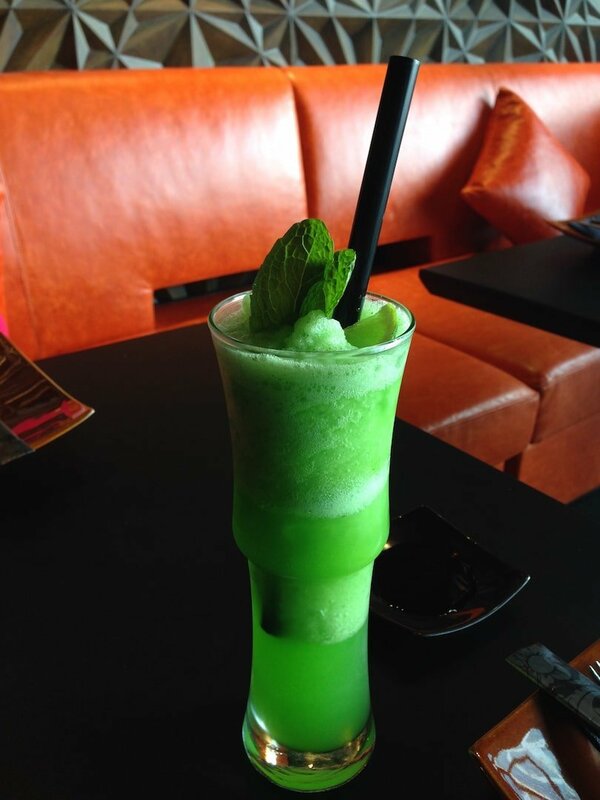 Mr. Arabian Notes went with his favourite mint lemonade to drink which was served in a large and unusual shaped glass, and also with the most enormous straw we’ve ever seen! 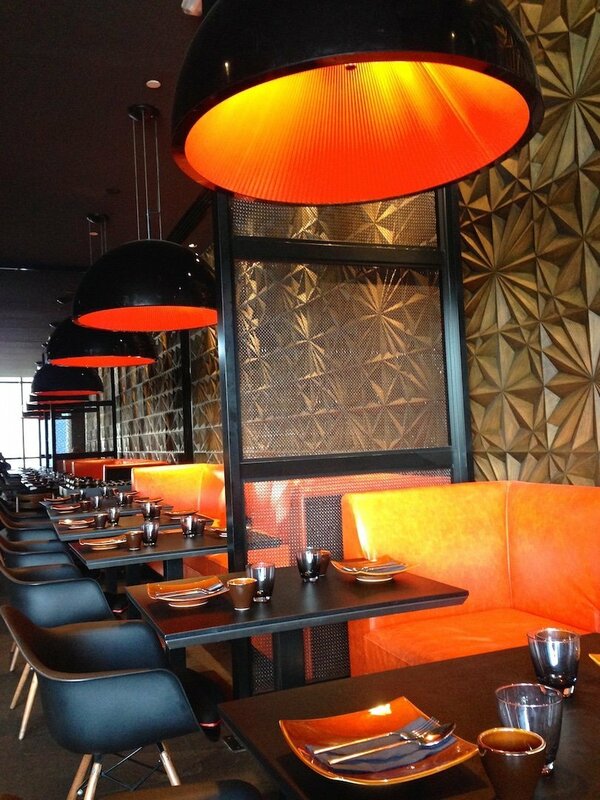 The chefs at Smoking Doll are all Thai, although the menu specialises in a range of Asian cuisines, including Thai, but also Japanese and Vietnamese. As we’d only ordered appetisers, they all came out at pretty much the same time which was fine, as we wanted to pick a bit here and there. The fish cakes were delicious and flavoursome, lots of thai fragrant flavour and very delicate. 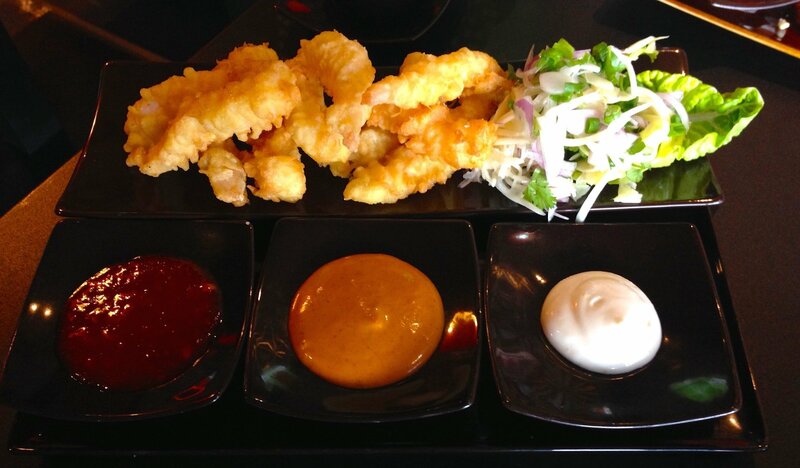 I love a bit of tempura shrimp, and these were especially good. Fried to perfection, crunchy but not overcooked, no sogginess, just yummy and served with a range of tasty sauces from very spicy to non spicy. We enjoyed the BBQ chicken maki rolls, though I’m not sure if I would order them again. There was nothing wrong with them at all, they tasted good – I’m just more of a fan of the tempura prawns and some of the other more inspiring items on the menu. Finally, we also tried the dumplings. We had wanted the hoi sin duck dumplings but sadly there were none available so we went with the chicken and sweetcorn ones instead. These were tasty, though next time I would much prefer to try the duck ones, I imagine these would be absolutely delicious! Overall, we were impressed with the food we did try and the menu has a good range of appetisers, sushi and main courses to choose from. 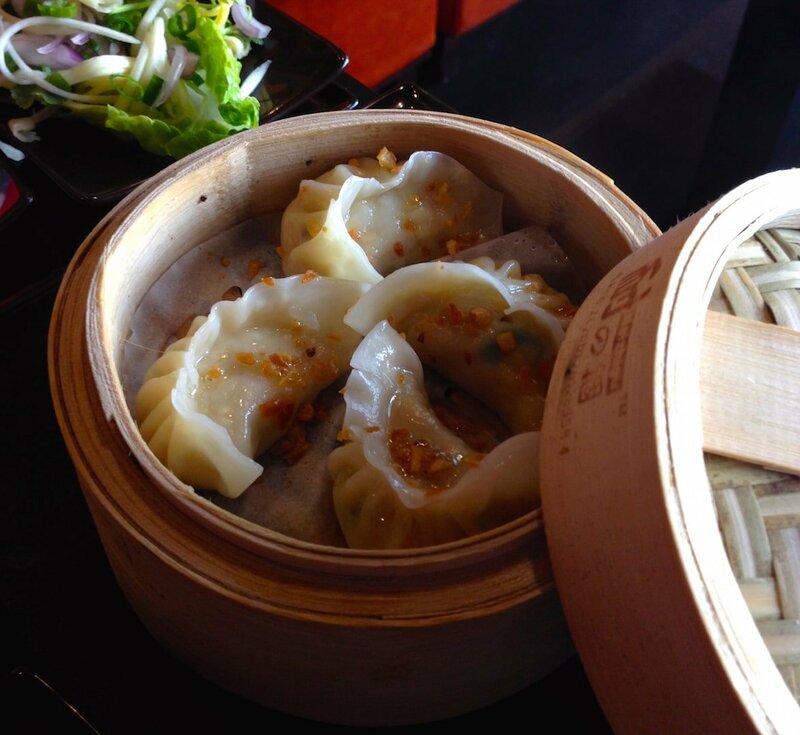 If you are a fan of Asian food, it’s definitely worth adding to the hit list – you’ll probably really enjoy eating here. Smoking Doll is at Boutik Mall on Reem Island and at Nation Towers Galleria on the Corniche. Call 600 560 603 for bookings and delivery.